The very popular Gilding the Gingerbread house has now been joined by a Gingerbread Chapel, a Gingerbread Lodge and a Gingerbread Tree so you can collect a gingerbread village! 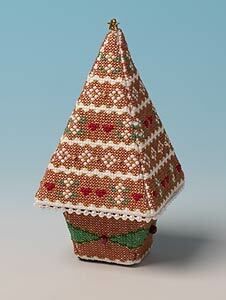 A cross stitch kit which makes a charming 3D Gingerbread Tree, one of 4 designs which make up the Nutmeg gingerbread village. Kit contains 16-count aida fabric, DMC stranded cotton embroidery thread, beads, trim, felt, plastic canvas shapes, needle, chart and full instructions.